Everything included for pumping on the go! 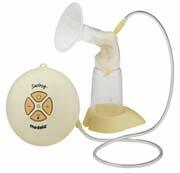 The Medela Swing breastpump can also be powered with batteries for pumping on the go. If used with the Easy Expression Bustier, this could be used hands free while up and about at home. Expression Mode�Simulates your baby�s slower, deeper suckling for maximum milk flow in less time. The breastshield with this pump is a size 24mm. If you have large breast and need a larger size, I will send a breast shield sizer with the pump so you can measure for a better fit, then the correct size can be ordered. If the SoftFit breastshield is too small, pumping may be painful.